Your ideas are so creative! Cute little guys! I like Geckos it's something about their feet. They say here that if you have one in your house it's bad luck to kill it! Love following along in your sketchbook! I like geckos, too, and this sketch is adorable! 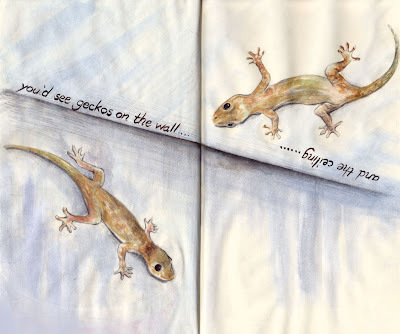 I own a leopard gecko and these are lovely, Im wondering if mine could crawl up the celing now! Just as cute as the ones I've seen in life! I see I'm not the only one who likes geckos - I believe they're quite useful in keeping less attractive 'guests' down too. And yours are as lovely as the real thing! Beautiful, and I love the perspective of the wall and the ceiling. Great painting!